John A. Mahummad, the "D.C. Sniper", is dead. But at the last few hours of his life, there was one final ironic item which deserves to be mentioned, if only to illustrate the huge gap between reality and Political Correctness, as exemplified by one of Mahummad's attorneys, Jon Sheldon. I mentioned this during an idle moment at this weekend's ARPC match, and my squad members found it difficult to believe. In the last hours of Muhammad's life, his attorney complained that the sentence was to be executed on November 10 ... the day before Veteran's Day. Apparently, Sheldon found it egrigious that Muhammad, a veteran of the Gulf War, would not be allowed to celebrate Veterans' Day before he was executed for the random murders of several innocent American civilians. Although the execution will come seven years after the shootings, it will be less than six years after a jury found him guilty of capital murder. Supreme Court justices John Paul Stevens, Ruth Bader Ginsburg and Sonia Sotomayor objected to the court's haste in declining Muhammad's case Monday, saying it "highlights once again the perversity of executing inmates before their appeals process has been fully concluded." Stevens, writing for the three, said Virginia had short-circuited the process by scheduling Muhammad's execution for Tuesday night, earlier than the court would normally have reviewed his petition. "By denying Muhammad's stay application, we have allowed Virginia to truncate our deliberative process on a matter -- involving a death row inmate -- that demands the most careful attention," Stevens wrote. He said he did not disagree with the court's ultimate decision that Muhammad's petition did not warrant the court's consideration. After the court made its decision, Jon Sheldon, part of the team representing Muhammad, expressed a similar concern about the rapid pace of the review. "In its effort to race John Allen Muhammad to his death before his appeals could be pursued, the state of Virginia will execute a severely mentally ill man, who also suffered from Gulf War syndrome, the day before Veterans Day," he said. We do respect and honor our military veterans, but there is a limit to this. Military service is no excuse for murder, especially under the circumstances which characterized the predations of John Allen Muhammad and Lee Boyd Malvo. Speaking as a veteran, my honor is besmirched by this man and this boy. Shooting unarmed civilians is not a legitimate act of war; it is, rather, an act of terrorism which conforms with the definition of terrorism. The goal of these two villains, in my opinion, was nothing less than to establish "... the state of fear and submission produced by terrorism or terrorization." The John and Lee show had no apparent purpose above mayhem and intimidation. To have allowed John Allen Muhammad to live to celebrate Veterans' Day would be to imply honors which he did not deserve. I'm glad he's dead. He worked for his punishment, he earned it, and earlier would have been better. To me, delaying his much-deserved death for seven years was an undeserved delay of justice. That he coerced his young protege' to acts of violence is not the least villainy of which he is guilty. Not content to show obeisance to the Saudi Arabian King, President Obama this weekend bowed deeply and reverently to Japan's Emperor Akihito. 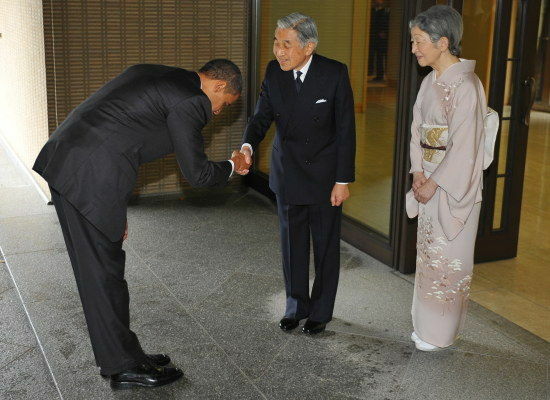 Adding injury to insult, as it were, Obama also bowed to Empress Michiko ... albeit much less deeply, and with much less respect. 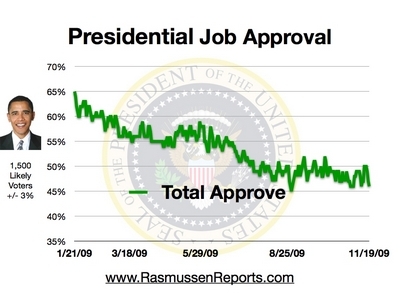 Is Obama misogynous? Well he didn't prostrate himself. Consider this Saudi Incident to be "Obama Bows (Part I)". I declined to make much of this first incident, but today it seems as if our president is willing to show himself as subservient to other national leaders. I am not happy with this loss of "face".